UiPath is the most widely used RPA (Robotic Process Automation) toolfor Windows Desktop Automation in the world today, driven by an enduring ambition to be built as the best technology. Robotic: In RPA, Robotic is termed as an entity which tries to mimic human actions or capable of doing complex tasks programmed by the computer. Process: It is any meaningful task done by a sequence of steps. Automation: Automation is doing a task without human intervention and, any entity which does a job without human intervention is known to be automated. So in a short and straightforward form, RPA is defined as mimicking human behavior/actions to execute a sequence of steps which lead to a meaningful activity automatically, i.e., without human intervention. UiPath is founded in the year 2005 by the Romanian entrepreneurs Daniel Dines and Marius Tirca. 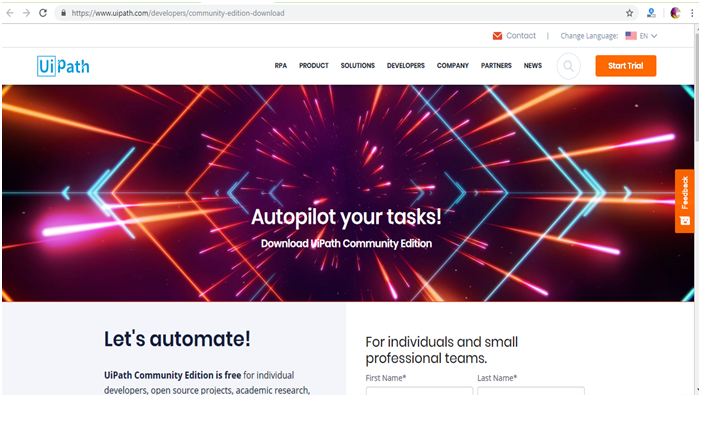 It is the most straightforward tool, automates repetitive/redundant tasks, eliminates human intervention, and provides drag and drop functionality for all the activities. UiPath Platform Components (UiPath Studio, UiPath Robot, UiPathOrchestrator). 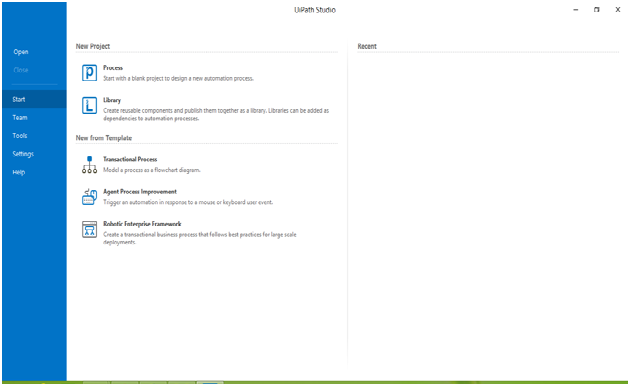 UiPath Studio Components(Ribbon,Activity Pane, Properties Pane, Control Bar/Pane). Intuitive: UiPath is easy to use and to create robots as it uses drag and drop, flowchart activities. Security: UiPath is secure to store and encrypt the credentials on the centralized server. Extensive Activity Library: UiPath has an extensive activity library that consists of pre-built, drag and drop actions. Recording: UiPath facilitates recording by having special orders for desktop apps, Citrix environment and terminal emulators by which automation becomes faster and precise. Universal Search: UiPath is also featured with Universal Search that allows performing a single search for all automation resources like libraries, activities, projects, and workflow. Powerful Debugging: UiPath offers an intuitive and flexible powerful debugging. Collaboration: UiPath promotes collaboration also that we can store, protect, and share scripts in MS Team Foundation and SVN. Third-party Integration: UiPath also facilitates us with the feature of Third Party Integration by which we can plug in various cognitive and OCR technologies from ABBYY, IBM Watson, Google, Microsoft text analysis at the API level. Server-Based Licensing: UiPath permits server-based licensing by which licensing process becomes centralized and easy to use. 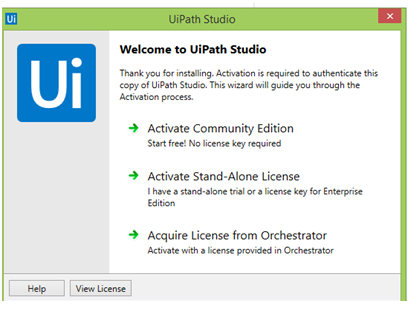 UiPath Studio, UiPath Robot, and UiPath Orchestrator are the three UiPath platform components. UiPath Studio: This component is an advanced tool that visually enables automation designing processes through drag and drop, flowchart activities. UiPath Robot: This component is the UiPath executor can interact with a large number of applications at the same time. UiPath Orchestrator: It is a web application used to manage, monitor,and to schedule multiple deployed robots and processes. Ribbon: It has many components like Recorder that allows users to record UI mouse movements and keyboard activities to generate automation scripts, Screen Scraping and Data Scraping that make scraping easy, User Events, and Variables. Activity Pane: It contains all the small tasks available to drag and drop in the workspace and configure according to the needs of every activity. Properties Pane: Configurations like setting the output of a particular activity or the task can be handled by using properties pane. Control Bar/Pane: This component is used to create variables, delete variables and also to deal with arguments. STEP 2: Scroll the page and you will get a form to fill the credentials. STEP 3: Click the button to request for community edition. 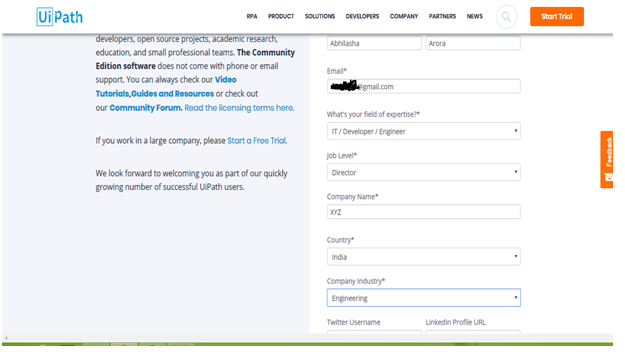 STEP 4: Check your email-id, you will have the UiPath Downloading link. Clicking that link will download an exe file on your computer. 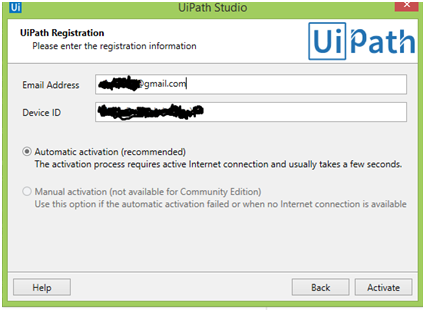 STEP 5:Run the downloaded exe file named by UiPathStudioSetUp.exe to install the UiPath and you will have the needed Setup installation. Step 1: You will have the given Screen after following all the steps above. Click the Start Free option as we are using free edition. Step 2: Now, you will have the given screen for the verification of your credentials (Email address, Device ID) and auto-detection of your Device ID. You will have to fill the Email ID and to click on the Activate button at the bottom on the right side. Every time the Nugget Package Manager libraries get deleted and the tool asks for its activation. This edition is lack of local hosting of UiPath Orchestrator server. UiPath is reliable and easy to use. It assists a quick automation process with the help of its drag and drops functionality. It facilitates seamless automation of data entry on any web form and desktop application. With the help of UiPath Orchestrator, you can launch the robots quickly. It offers 100% playback accuracy by saving countless man hours and requiring zero codings or scripting.